This set of 600 Battery Operated Timer Lights is powered by batteries rather than mains or solar power, making it perfect for lighting any area of the home or garden without the need for power sockets and direct sunlight. The timer function is simple to operate; simply press the button and the lights will automatically stay on for 6 hours, then turn off for 18 hours, meaning no more climbing out of bed when you remember you haven’t turned the lights off. A perfect alternative to solar and mains powered lighting, these are the ideal solution for areas with no access to mains power or direct sunlight - perfect for illuminating parties throughout our dreary British summers. The lights look amazing in my garden and were perfect for our party, but look so great i'm going to leave them up. They're so long they went round and between three trees and my house. Excellent value. 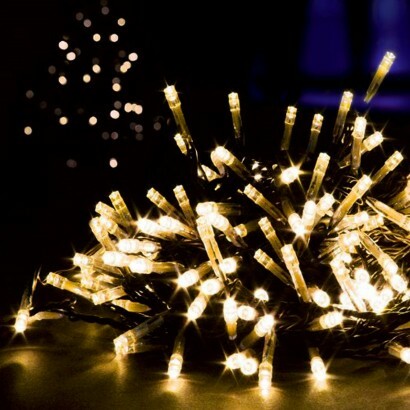 Fantastic lights, amazing how quickly you can use 60 meters of lights! Only down side is they are not the brightest but as its battery powered i guess this will always be the case. Great product. Just as advertised and just what we wanted. Delivered so quickly. First class company to deal with including no quibble honoring a discount when I forgot to enter my promotion code! We're buying from the Glow Company again.